Nextpeer launched about a year and half ago as a way for independent game developers to add multi-player mode to mobile apps. 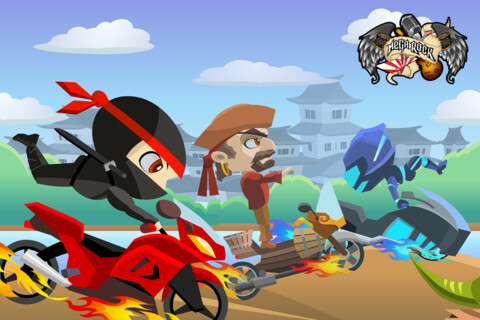 While building these gaming platforms can be slow-going at first, a breakout game called A Bike Race of Ninja Temple is helping to add about 100,000 users per day to the Israeli startup’s network. Muoyo Okome, a Microsoft business manager who moonlights as an indie game developer, used some open source code for games that resemble last year’s hit Tiny Wings. Tiny Wings is an indie hit out of Northern Germany and a physics game that has you press the screen to roll a bird off different hills. He then re-skinned it with a ninja-bike theme. He called the game A Bike Race of Ninja Temple. The difference between it and Tiny Wings though is that you can’t play it in single-player mode. You have to find someone else to compete against in real-time using Nextpeer’s network. Given that the game is blowing up and is currently ranked #14 on the free charts in the U.S., it’s adding between 60,000 and 70,000 users a day to Nextpeer’s network. Yesterday, Nextpeer served 200,000 multiplayer tournaments, with a peak of 300 players per second. The startup has about 100 games on its platform. Okome says he’s now making between $2,000 and $3,000 per day from advertising and in-app purchases of different racing characters and power boosts. “It’s pretty cool to be making money from something that isn’t my job and is fun,” he said. Initially he used Game Center, but got feedback from players that they wanted to compete against others. In a networking group about building games, he learned about Nextpeer and quickly integrated the company’s SDK or software development kit with an engineer he had hired off of oDesk. He says he’s now going to focus on creating more racing characters for the game and building out its freemium model. As for Nextpeer, the startup has pivoted its model a little bit since launching a year and a half ago. It used to have a virtual currency-centric model where players would have to top up to continue playing in multi-player mode. Initially, they would get some free currency to start and whenever they would compete, a player would have to put up a bet with some of that virtual currency. Whoever won would take the entire pool of coins. Nextpeer’s CEO Shai Magzimof says the company is now moving toward more of a game promotion and advertising model. The early virtual currency model didn’t work because it took too much effort for developers to integrate it. The company also found that prompting players to spend on multi-player mode dissuaded them from continuing in the game. They play more without being asked to pay, naturally. So Nextpeer instead is launching something called GameStream, which shows off what players and friends in the network are doing in real-time. In that sense, it’s a news feed of gaming activity just like Facebook’s Ticker or what OpenFeint used to offer. Magzimof says GameStream is free for now but eventually they’ll move toward a paid model where advertisers will pay to acquire users. Nextpeer has raised about $1 million in angel funding.